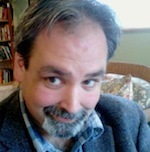 Robert Archambeau is a literary critic and professor of English at Lake Forest College. His most recent books are Laureates and Heretics: Six Careers in American Poetry (2010) and Home and Variations (2004). His edited books include Letters of Blood and Other English Works by Göran Printz-Påhlson (2011), Vectors: New Poetics (2001), and Word Play Place: Essays on the Poetry of John Matthias (1998).